Our proposal entitled, Assessing predator risk to diadromous fish conservation in the Penobscot River Estuary, has received funding from the Maine Outdoor Heritage Fund. With this funding, we are excited to develop new collaborations with Justin Stevens and Christine Lipsky, of the NOAA Northeast Fisheries Science Center’s Atlantic Salmon Ecosystems Research Team, and Mitch Simpson at Maine Department of Marine Resources’ Division of Sea-Run Fisheries. 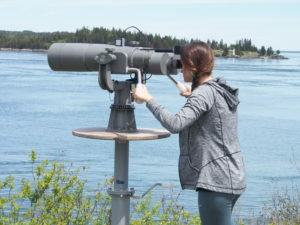 The funding will support an analysis of existing and ongoing datasets on marine mammal abundance on the Penobscot River, which have been collected for the past five years during NOAA’s monthly or bimonthly surveys of the river. Combined with their data on fish abundance from hydracoustic and trawl surveys, and DMR’s data on observed injuries on salmon at the Penobscot River dams, we hope to better understand the potential impact of seal populations on local salmon and sturgeon. A secondary aim of this proposal is to begin to develop a seal photo-identification research program on the Penobscot River. 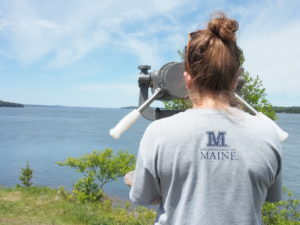 This portion of the research will begin next summer, so stay tuned for some seal photos on an upcoming project website!